When you’re opening a new restaurant, having a storefront sign up shows that you’re officially open for business. Having a nice, illuminated dimensional sign will definitely attract more people than a temporary banner, especially around dinner time. 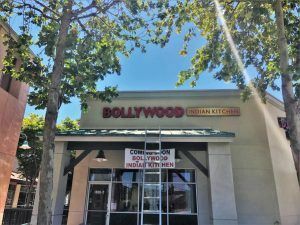 Bollywood Indian Kitchen is a new Indian restaurant in Simi Valley, California. When they moved into their location, the signs from the previous business were still up so they decided to use that to their advantage. There were three existing signs up. One above the entrance that faced the street, one facing the street directly, and one above the second entrance that faced the inside of the plaza. 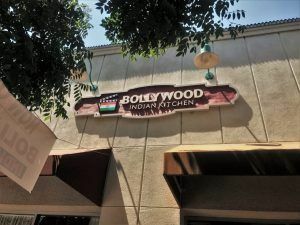 Bollywood Indian Kitchen decided to replace all three signs with the same type of signs that were already up, just with their logo. The two signs that faced the street were channel letters signs with an illuminated box. When removing the old signs, we look down the existing channel letters, but only removed the face on the boxes. 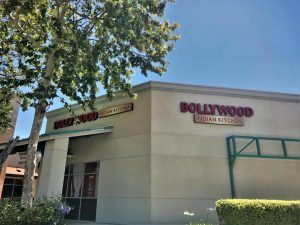 We made new front-lit channel letters for “BOLLYWOOD”, and made new faces for the existing boxes. This saves the restaurant a significant amount on the new signs because we made two new box sign faces instead of the whole frame and faces. We used red LEDs for both signs. If a custom color is being used, we’ll usually use white LEDs to keep the color accurate, but to emphasize the red in this sign, we went with red LEDs. LEDs may not have as many custom colors as neon, but with the combination of LED colors and digital printing, we can create any color you need for your sign. The non-illuminated sign is an HDU foam sign. This sign didn’t need to be internally illuminated because there were already lights on the building so the sign could be seen at night time. This one ended up being a different style from the channel letter signs. We went through different proofs and renderings seeing how the sign would look with the same red and gold color scheme as the cabinet signs, and a bold red and white, but in the end, they decided to go with more neutral colors and added their logo. The HDU foam was carved in a way that the letters, logo, and borders were raised. Most of the sign was custom painted, with the exception of the logo which we digitally printed. The new signs look great, and they are sure to attract customers coming from all directions.